Whole lotta ST Conventions coming in Oct./Nov. So far it looks like Jason will be at Birmingham, Oct. 19–21. Many of the rest of the Cons don't have a lot of celebs attending as yet, but that will probably change as the dates get closer. Re: Whole lotta ST Conventions coming in Oct./Nov. The Shat Tweeted at Jason about the Birmingham Convention. "Let's plan on meeting up, get to know each other once and for all . . ."
"We've actually met and had lovely chats on a couple of occasions . . ."
The Shat's memory is as good as mine. I've seen him a couple of times at Conventions and I can't anymore. It's so uncomfortable - he can get very rude - even to young children. I get it that he is getting up there in age - but if he doesn't enjoy the conventions and interactions with fans he should stop doing them. I suspect both his ego and perhaps his pocketbook require the constant feeding of conventions. He doesn't seem to get very many paid gigs that are not priceline commercials anymore. Hmm... that sounds a bit cattier than I meant it. But it's no secret that his ego is huge - anyone who follows him on twitter knows that. I did get to see Karl Urban at the Philly Wizard World in May. He seemed pretty nice and down to earth during hi Q&A. He literally sat on a couch and answered questions from the audience for a little bit over an hour. My friend was like "He's my favorite ST character!" And I was like "Eomer! Skurge! Julius Caesar!" lol. Nice poster! Thanks for posting it, Servalan. So wish I could have gone to this!!!! I gotta stick to encounters on this coast for a while. Here are pix from Birmingham . . . with Jason and the Shat. Thanks for posting the link; Helen. 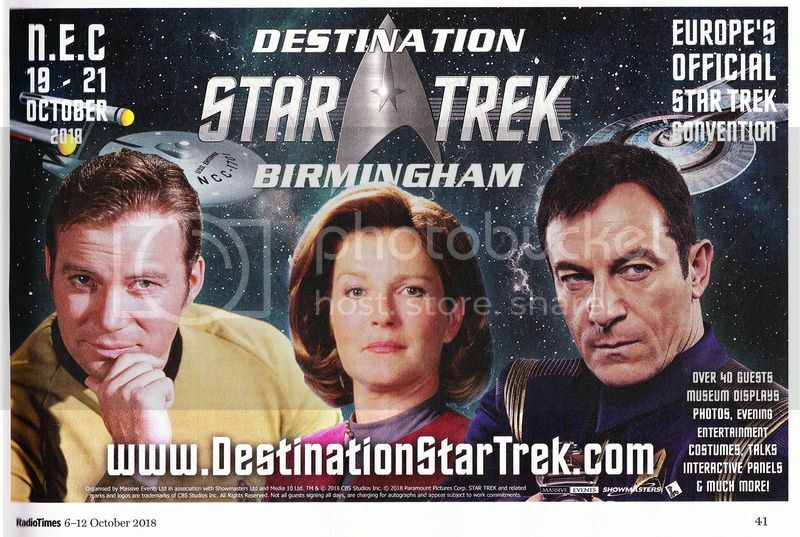 Nice summary of the DST Star Trek in Birmingham. Thanks for the link. There are some seriously distorted faces in photos of some older ST actresses - it's so sad they feel the need for facelifts, botox etc. Nice to see how many of the cast from all the ST series were there. it's so sad they feel the need for facelifts, botox etc. Unfortunately , that's H'wood for you. If women feel the need to keep working, they have no choice but to resort to surgery/injections. As soon as the first wrinkle shows, actresses are relegated to lesser roles or playing mothers and grandmothers. Jason said, in one of the Look Away interviews that he gets offered roles as fathers now a lot and that actresses who are his age are getting scripts for grandmothers.The saying goes, "Women get wrinkles; men get character." A very few, like Meryl Streep and Helen Mirren, seem to be able to attract good roles, and their age and appearance don't matter. What's even more sad is that they don't look younger. They look like someone who had surgery to look younger.